In 1925, Middletown resident, Rene D. Grove, established the Performo-Toy Company and began making small wooden toys at his North Spring Street residence. His business grew rapidly and the 25 employees often had trouble filling the volume of orders for the popular toys. Performo-Toy Company manufactured 35 to 40 toys including Joy Boy, Dancing Girl, Heinie the droopy-eared dog, and Bouncing Trixie. The toys were distributed all over the Northeast by the prestigious George Borgfeldt Company headquartered in New York City. All the Performo toys were great fun, but one stood out as the most popular – Micky (not Mickey), a black and white mouse with a touch of red. As he did with many of his toys, Rene applied for and received a patent (US Patent # D70,840) for his “Animal Toy” on August 17, 1926. 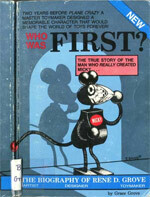 The name Micky was derived later from a contest held among the employees. Employee, Larry C. Grove, later moved to Iowa and wrote of how he learned of alliteration and suggested Micky should be the name of the new mouse toy. From 1927 to 1931, the Micky Mouse toys “sold like hot cakes” to the extent that production of the other toys was cut in order to fill the Micky orders. About the same time Borgfeldt was selling Micky Mouse toys all over New York City and the Northeast, Walter Disney arrived in New York for a meeting with Charles Mintz of Universal Pictures. Disney had been working with Mintz producing Oswald the Rabbit cartoons. Disney felt initial success of the animated short films justified an increase to the existing $2,250 per cartoon advance. Mintz was thinking just the opposite and informed Disney the advance would be reduced. When Mintz offered Disney only an $1,800 advance to produce the next Oswald the Rabbit episode, Disney refused. Because Mintz owned the rights to Oswald the Rabbit, Disney found his fledgling animation studio was without a character. Further aggravating the situation for Disney was the fact that Mintz had already recruited four of Disney’s principal animators to work for Snappy Comedies, an animation company operated by Mintz. The events that followed are largely circumstantial, but Middletown historians believe it is likely that Walt Disney borrowed his most creative idea from the Performo-Toy Company. It is known that a mouse toy with the name Micky was being sold in toy stores all over New York City while Disney was visiting. Disney historians say the idea for Mickey Mouse was conceived by Disney while on the train to California, following the stressful New York business trip. The story goes that Disney suggested Mortimer for the name of his mouse character, but his wife Lillian felt Mickey was a more appropriate name. Regardless of how Disney reports the origin of Mickey Mouse, Middletown historians are certain that Micky Mouse originated in Middletown more than a year before he appeared in Hollywood. Was Disney’s idea for Mickey Mouse derived from the popular Micky Mouse toy? Before you decide, consider the possibility that Micky Mouse toys were so popular they may have been sold on the train Disney was riding on his way from New York City to Los Angeles. Micky Mouse, the toy, and Mickey Mouse, the cartoon movie star, coexisted from 1928 to 1931. By 1931, Disney’s new animation and sound techniques had launched the cartoon Mickey to superstar status. Walt’s brother Roy was put in charge of marketing Mickey Mouse merchandise. One of the items he sold was a toy replica of the cartoon. Mickey and Micky were now competing in the same market. Ironically, they used the Borgfeldt Company, the same distributor Performo-Toy Company had been using for years. The Disney Corporation sued the Performo-Toy Company claiming they took Micky from Disney. The small toy company was no match for the large production company and the courts ordered the Performo-Toy Company to stop all production of the Micky toys and destroy any existing stock. Even catalogs containing Micky had to be destroyed. This tragedy, along with the Great Depression, was enough to put the Performo-Toy Company out of business. 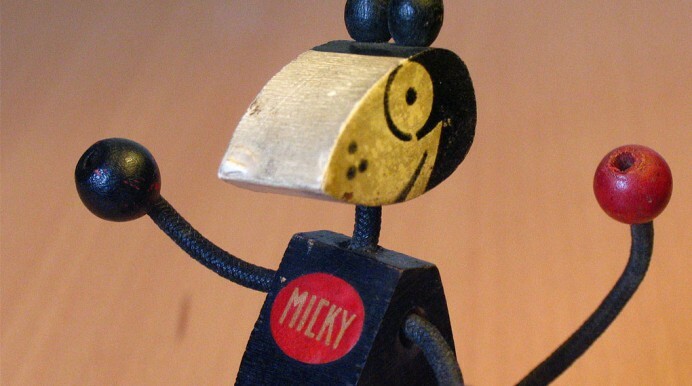 Many of the original Performo toys, including Micky, are currently on display at the Middletown Historical Society. Some information taken from 2011 Middletown Borough website.